Fishing the North Coast Guide Service offers year-round guided sport fishing trips on the Mad, Eel, Smith, Trinity and Klamath Rivers. 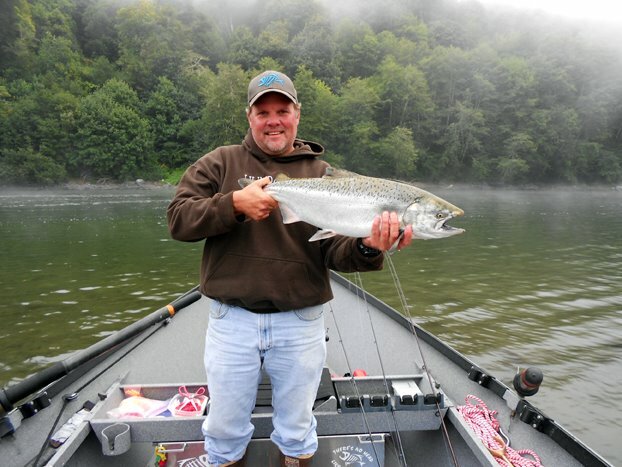 FTNC specializes in fishing trips for King Salmon and Steelhead. FTNC books all of our trips during the peak periods of each fish run to ensure our clients have the best opportunity to catch fish. Kenny Priest has been fishing Northern California waters for over 40 years. Fishing has been his passion since childhood and it has grown every year since moving to Humboldt County in 2003. In addition to honing his skills as a river fisherman, he has thousands of hours of ocean boat experience and handling on waters from Fort Bragg to Crescent City. He is licensed by California Department of Fish and Wildlife and is bonded and insured. Priest possesses a warm friendly personality and is eager to provide instruction to his inexperienced clients in an effort to help them become better anglers. For his more experienced clients, Priest focuses on putting fish in the boat and helping them enhance their skills on the river. He can accommodate first-time anglers as well as expert fishermen. Priest loves being on the water and will always give you 100% effort so that you catch fish. He will do everything he can to ensure you have a great time on the river and your stay here on the North Coast. Kenny, Please give me a call when you have time.